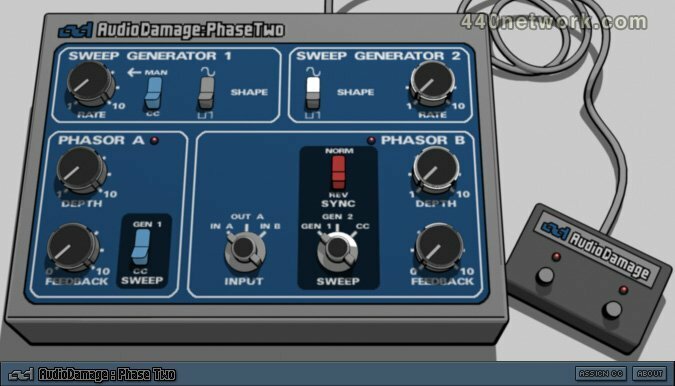 Audio Damage's Phase Two plug-in is a perfect digital recreation of the Mutron Bi-Phase, one of the most sought-after vintage phaser units, highly prized for its liquid and subtle stereo phasing abilities. 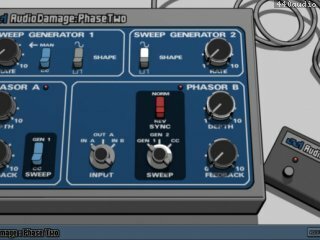 Phase Two features two separately controllable 6-stage phasers, and like the original unit, these two phasers can be routed in series or parallel, for everything from subtle stereo washes to full-blown alien attack. Using the extra CC feature, which takes the place of the "Opti-Pedal" in the original unit, you can manually sweep the phaser frequencies with a MIDI controller, such as a mod wheel or aftertouch. The cel-shaded user interface of Phase Two matches the original unit in every respect, right down to the footswitch, so anyone familiar with the vintage unit will feel right at home using the digital recreation. Every object on the interface has Audio Damage's standard MIDI Learn feature, so the unit can be fully controlled from external hardware controllers. Phase Two has been updated on all platforms. This update includes minor bug fixes in the AU, plus 64-bit versions of all platforms.